For today's mani I tried a new polish for stamping, Catrice Purplelized. It was a little bit sheer, but as you can see that wasn't a problem. I can't even tell if it fully covered everywhere because it's so sparkly! Here it looks purple, but as you can see in the bottle, the color can look a bit different as well. 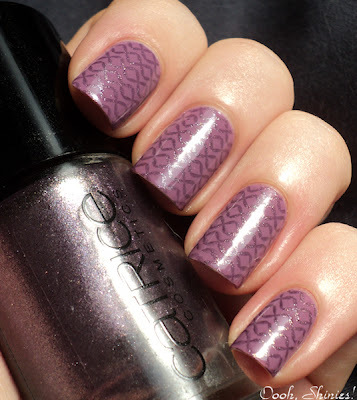 I tried it on a few polishes and it also looked nice on taupe kinda colors, but since I already used Below Deck and Purple Grey just a few days ago, I'll do that combo some other time. 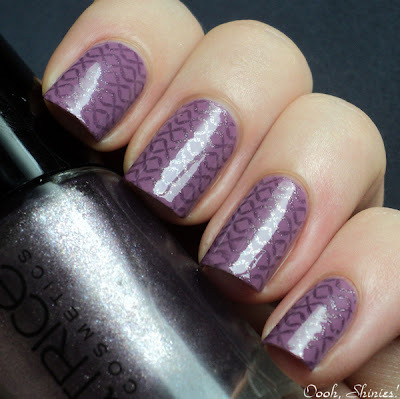 Today I went for Color Club Uptown Girl (2 coats) and an image from BM plate 203.